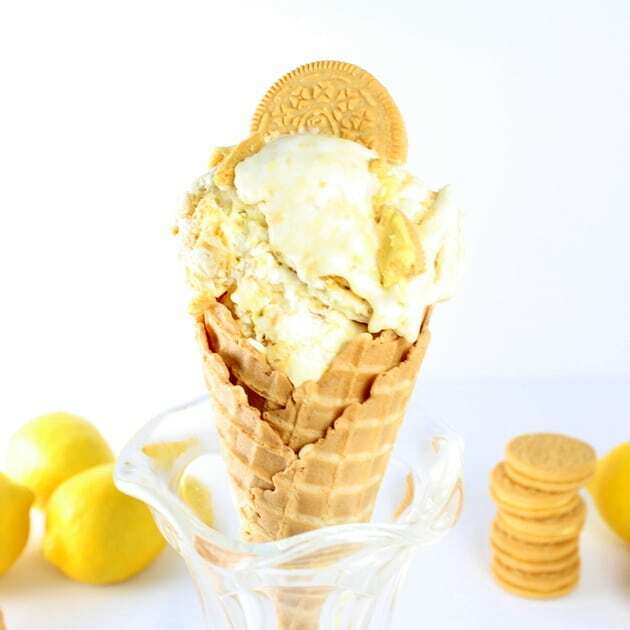 Lemon Oreo Ice Cream – an easy and churn-free delicious, lemony ice cream experience in every bite!? 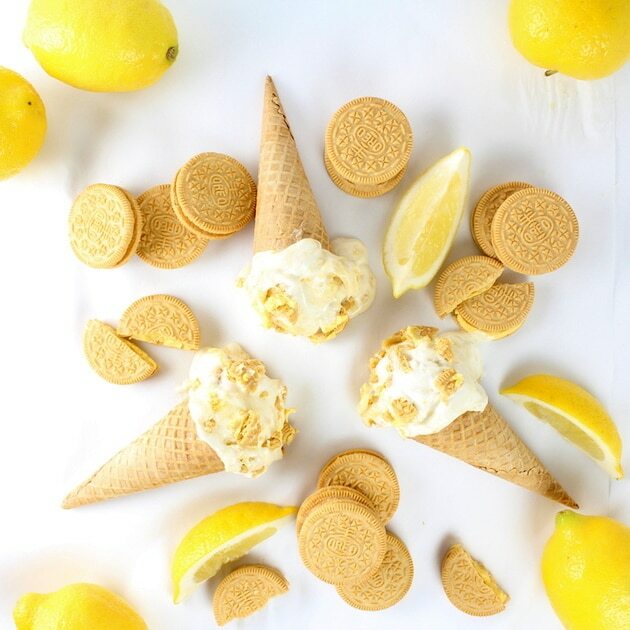 If life gives you lemons… wait for it… make Lemon Oreo Ice Cream!✨ Yes, I know – completely brilliant – right! Why didn’t I think of this sooner?? Lemon Oreo Ice Cream has got to be one of my most magnificent creations!? My niece Tamar takes after her Uncle B. She is part of the “chocolate is a vegetable and should be consumed in large quantities very frequently” club. She came to visit a few summers ago and we did what any loving family would do… we shared our newfound love – Lemon Oreos – with her.? It was love at first bite.? She and B hung up their chocolate-eating license for the week and inhaled lemon oreos like it was their job. I was so proud!? You see lemons are one of my very favorite things. They are so so wonderful. They are low in calories, have zero fat and truly make everything taste better!? For example they turn plain water into a delightfully refreshing beverage in one squeeze. They can really take anything from drab to fab, like this Parmesan Crusted Chicken or these Grilled Rosemary Lemon Chicken Thighs (two of my favorite entrees thanks to my dear friend Mr. Sunshine AKA lemon). 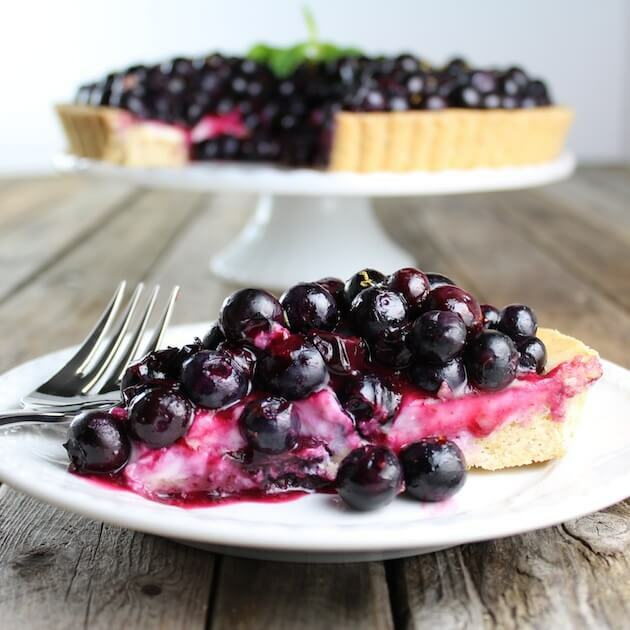 Lemon juice makes a delicious and easy dressing for salads, it provides balance to sweet desserts like the Summer Blueberry Mascarpone Tart and it makes some of the most delicious pound cake!? 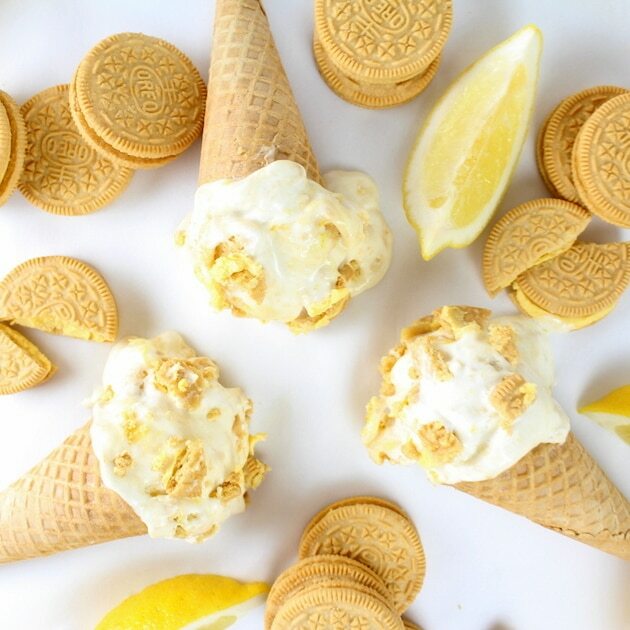 And now it’s one of the key ingredients in this lemon summer dessert… Lemon Oreo Ice Cream (no need to hold your applause)!?? 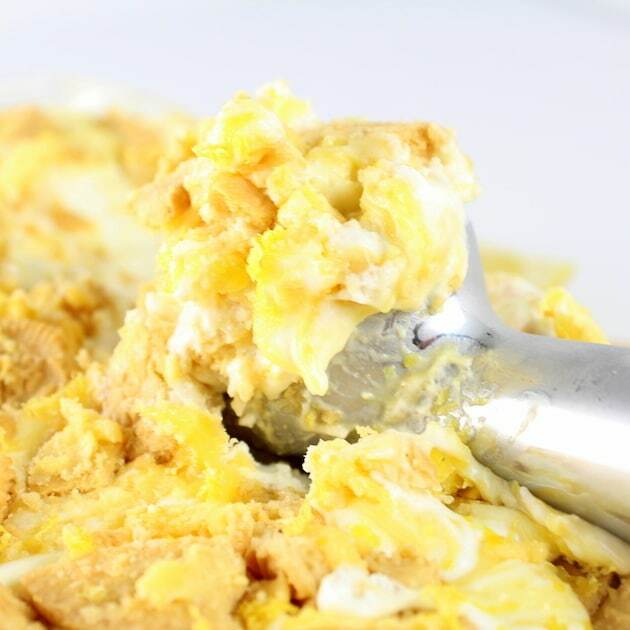 Plus it only requires 5 ingredients and takes about 15 minutes to whip up!! Mind-blowing, right?!? This recipe takes lemon sherbert and lemon gelato to an entirely different place.? Because I really care about you and want you to spend every second of your summer doing fun things with your people, this ice cream creation is “no churn” AKA no work, and no ice cream maker required. (Totally appropriate if you want to do the happy dance right now.??) Not even kidding – it’s super-quick and so easy.? First you crumble up a sleeve of lemon Oreos in a plastic zipper bag with a rolling pin. Take another sleeve of Oreos and quarter them with a sharp knife and set side. Get out your lemon curd, put it in a bowl, add tablespoon of water and give it a good stir to loosen it up. Next add sugar, whipping cream, lemon juice and lemon zest, and beat it until you see soft peaks. Then gently fold the crushed Oreos into the whipping cream mixture and pour half of it in a 9×5 freezer-safe container. Dollop about 5 tablespoons of the lemon curd into the half-filled container. Take a butter knife and cut through it only 3-4 times. This will create some nice ribbons of lemony goodness throughout the ice cream. Now take half of the quartered lemon Oreos and drop them into the mixture. Use your finger or a knife to push them into the ice cream. 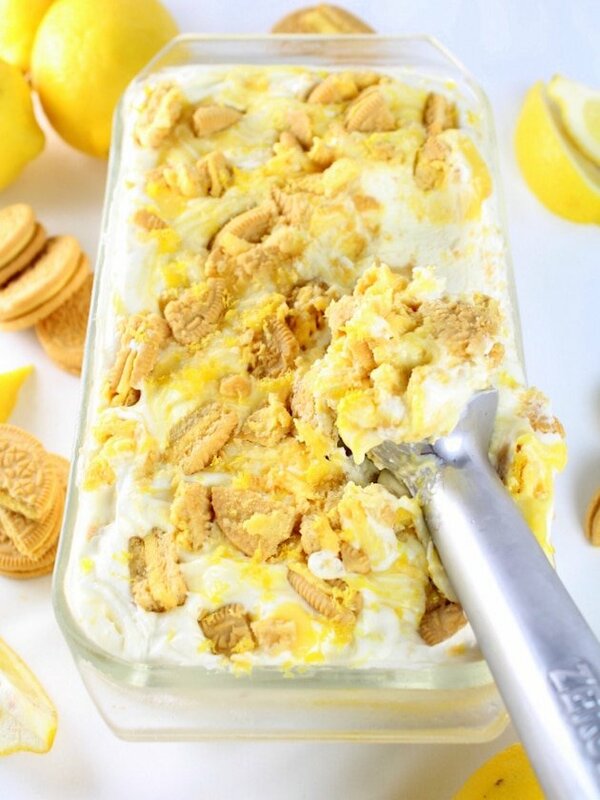 Now add the rest of your whipping cream mixture and repeat all these steps again, but leave some of the quartered Oreos on the surface, and sprinkle some lemon zest on top to make this ice cream as beautiful as it is delicious. The only thing left to do is cover it, pop it into the freezer (as deep as you can so it freezes faster), and wait… truly the most difficult part of the whole process.? 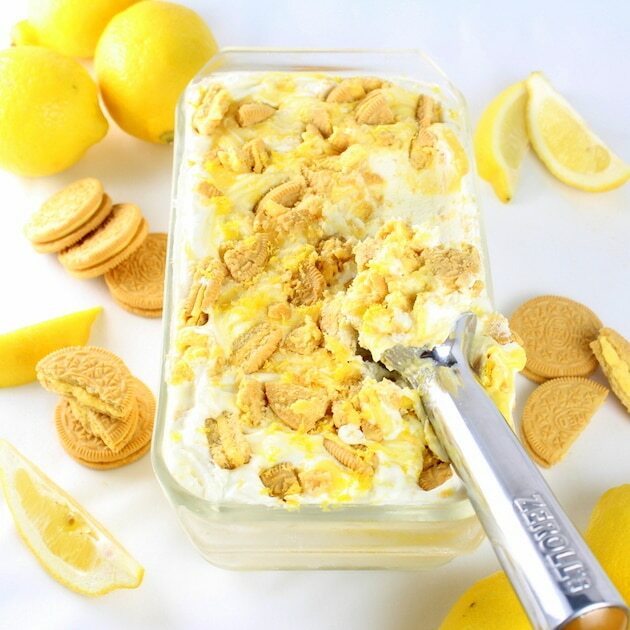 This Lemon Oreo Ice Cream is such an easy and delectable summer dessert.? I hope you enjoy all this lemony summer deliciousness as much as I do. It truly embodies everything summer is about: eating refreshing ice cream on warm summer days, spending less time in the kitchen, and more time with the ones you love most!? 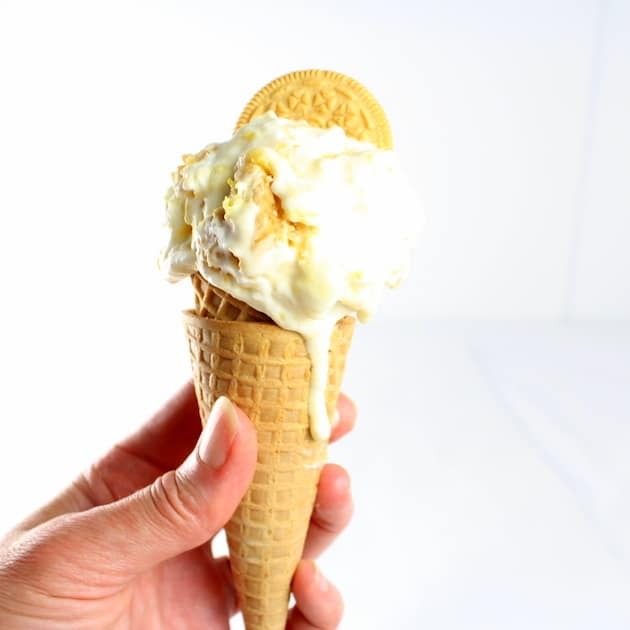 Lemon Oreo Ice Cream - an easy & churn-free delicious, lemony ice cream experience in every bite! 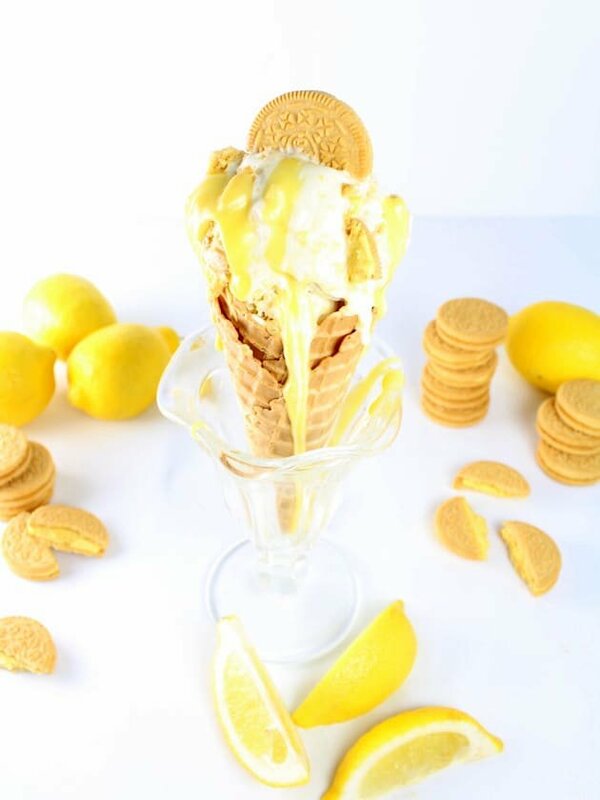 Fresh lemons, lemon curd, cream, sugar, & lemon Oreos- YUM! Grate at least 2 tablespoons of lemon peel (slightly more for garnish) - a citrus zesting tool or a fine grater works well for this. Squeeze the lemons and reserve the juice. Here’s a great hand citrus squeezer I like to use. 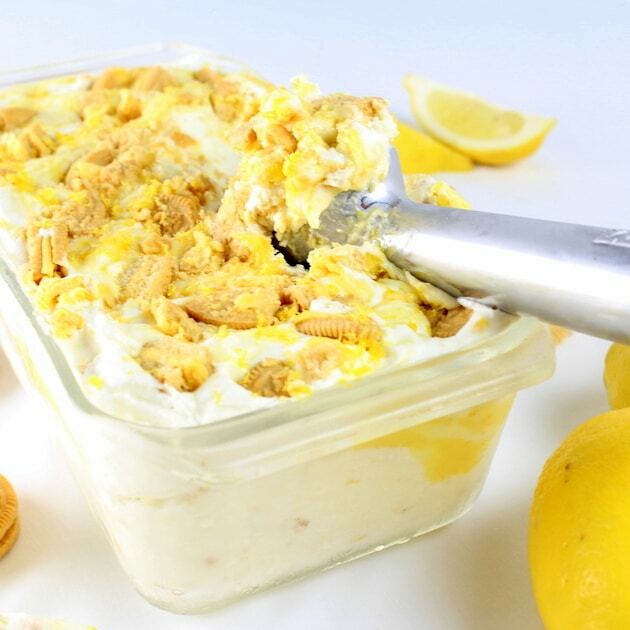 Place lemon juice, lemon zest, sugar, and heavy whipping cream into a mixing bowl. Using an electric mixer, beat on high until soft peaks form when the beaters are lifted. Fold in the crushed Lemon Oreos. Pour ½ of the whipping cream mixture into a 9x5 freezer-safe container. Add 5 tablespoon dollops of lemon curd mixture evenly distributed across the container, then drag a butter knife or thin spatula through the dish 2-3 times to create some ribbons. Add ½ the quartered oreos (push some of them down into the cream). Pour the rest of the whipping cream mixture into the container, and follow the same steps again with the rest of the ingredients. Cover and freeze in the coldest part of your freezer for 3 – 6 hours, or until it's hard. Garnish with more lemon zest and Lemon Oreos if desired. You can skip the lemon curd if you want to simplify the recipe even more. The outcome is still amazingly delicious. 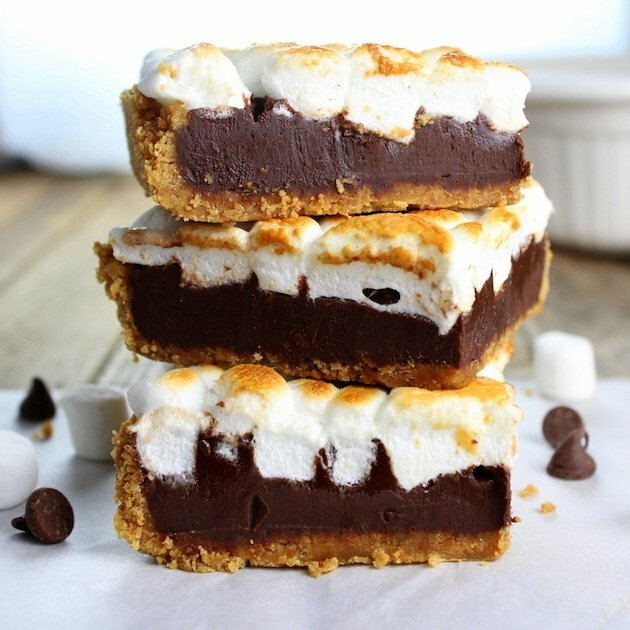 If sweetness is your weakness, you’ll love these other reader favorite desserts!